As a graduate student, I find extracurricular activities to be the best way to connect with undergraduates. Listed below are a few I take part in at the University of Iowa. The photo to the left is of the UI Solar Car Team. Here we were at an exhibit in the Spring of 2014 to advertise our mission. For a more detailed list of organizations I'm involved in see my CV. 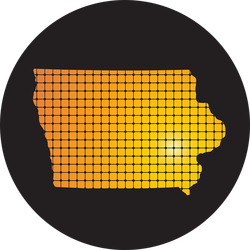 The UI Electrochemical Society Student Chapter was founded in 2014. Electrochemistry plays a pivotal role in enhancing fields like medical technology and energy storage. For more information about our club contact me or a member of the Leddy Lab. To contact someone in the Leddy Lab, click on the webpage button below. The purpose of the UI Solar Car Team is to compete in the American Solar Challenge. This is a 1000+ mile race that takes roughly nine days where teams from various universities across the country race their solar powered car. For more information, see the website by clicking on the button below. The Math Modeling Competition takes place once a year. Students take part in formulating a multifaceted model that presents a solution to one of two questions posted the day before the competition. For more information, see the website by clicking on the button below.